It is now easier and more affordable than ever to purchase and install solar shingles on your roof, as a means of saving energy and reducing electricity costs in the long run. When you think about solar power, do you picture bulky panels protruding from rooftops? If so, think again. With the advent of solar shingles—photovoltaic cells designed to look like asphalt roofing shingles—home-based solar power is becoming more appealing, both aesthetically and economically. Thanks to advancements in thin-film photovoltaics, these slim-profile shingles are lightweight and flexible. They integrate almost seamlessly with traditional asphalt shingles, although, because they tend to be dark in color, they blend in best with dark roofs. 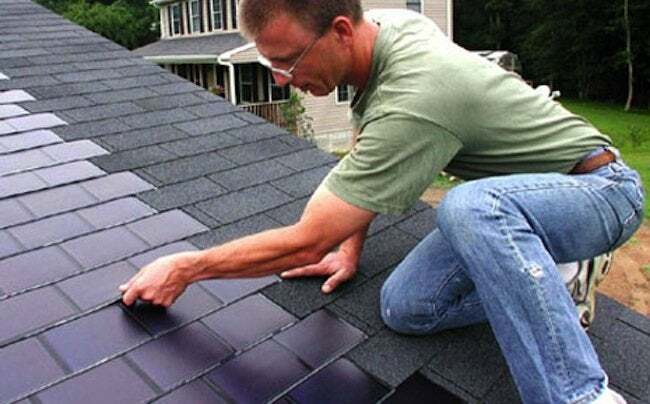 Solar shingles are most commonly used in conjunction with the existing power grid. This ensures that your home has power even when the sun doesn’t shine. It also means that if you’re lucky enough to generate more power than you use, you may be able to sell the excess back to the power company. Solar shingles must be installed by a qualified roofing contractor, and you’ll need an electrician to hook them up to your electrical system and install an “inverter,” which converts the direct current they generate to standard AC power. These shingles make solar a more accessible and attractive option, but they’re still pricey. As with any big purchase, do a careful cost analysis, and don’t forget to look into solar tax credits.